At least six people have been killed by falling trees as a powerful Nor’easter pounds the East Coast, submerging Boston and parts of coastal Massachusetts. The storm system known as ‘bombogenesis’ toppled trees and power lines elsewhere on Friday and dumped more than 20 inches of snow. On Friday morning, storm surges of up to four feet rushed over the sea wall and into city streets as Winter Storm Riley took hold in Boston. While Massachusetts was pounded by floods and rain, much of the East Coast endured heavy snow and winds of up to 60 mph. Forecasters said rain and snow was expected to slowly come to an end early Saturday, hanging on across southern New England the longest. In Putnam, New York, an 11-year-old boy was killed on Friday when a falling tree struck his home. In Virginia, six-year-old Anthony Hamilton died when a tree fell on his home in Chester. About 50 miles away, James City County Police said that a man had died when a tree fell on his vehicle. Another motorist was killed near Stamford, Connecticut after a tree fell on a car, state police said. In Baltimore, officials confirmed the death of a woman, 77, who was struck by a large tree branch and pronounced dead at the scene. In Newport, Rhode Island, 72-year old Robert Beaver was hit and killed by a tree at his home down the street from The Breakers, the Gilded Age mansion built for the Vanderbilt family. Voluntary evacuations have been in place along the coast since late on Thursday night before the floods began. 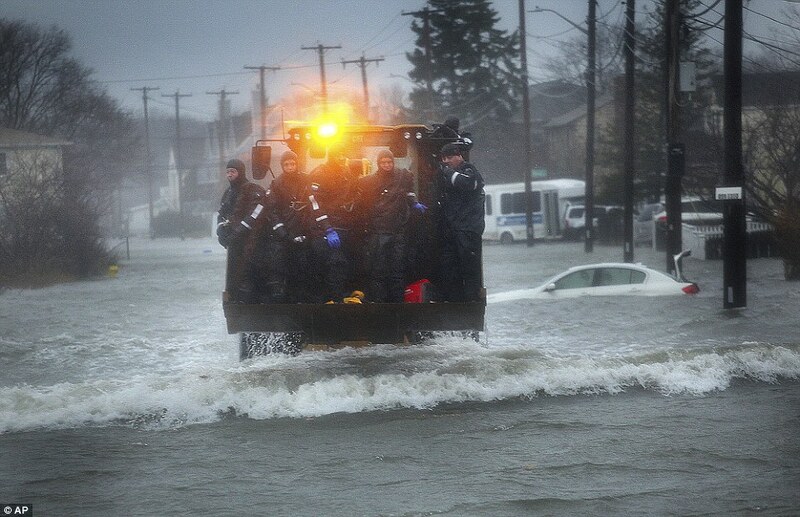 The National Guard has been called in to parts of Massachusetts to assist local authorities with evacuations. Shocking videos showed people kayaking through the underwater streets and trucks being swept away by waves. The intense storm has paralyzed travel along the entire north east coast, causing thousands of flight cancellations and chaos along railways. Some 3,227 flights have been canceled and another 3,134 have been delayed as a result of the storm. As of midday EST, an estimated 500,000 people along the northeast coast had lost power and more were expected to see outages as the day wore on. By evening, that number had doubled to 1.4 million.